The goal of this research was to evaluate and estimate the effectiveness of flashing beacons at stop-controlled intersections as one of the strategies in the Evaluation of Low-Cost Safety Improvements Pooled Fund Study (ELCSI-PFS), Phase I. This research provides Crash Reduction Factor (CRF) and economic analysis for the effectiveness of flashing beacons at stop controlled intersections strategy. The estimate of effectiveness for flashing beacons at stop-controlled intersections strategy was determined by conducting scientifically rigorous before-after evaluations at sites where this strategy was implemented in the United States. The above safety improvement and all other targeted strategies in the ELCSI-PFS are identified as low-cost strategies in the NCHRP Report 500 guidebooks. Participating States in the ELCSI-PFS are Arizona, California, Connecticut, Florida, Georgia, Illinois, Indiana, Iowa, Kansas, Kentucky, Maryland, Massachusetts, Minnesota, Mississippi, Montana, New York, North Carolina, North Dakota, Oklahoma, Pennsylvania, South Carolina, South Dakota, Tennessee, Texas, Utah, and Virginia . The Federal Highway Administration (Office of Safety Research and Development) managed this study. The project team members were Kimberly Eccles, Nancy Lefler, Dr. Hugh McGee, Dr. Frank Gross, Dr. Forrest Council, Michelle Scism, Ram Jagannathan, Dr. Bhagwant Persaud, Craig Lyon, Dr. Raghavan Srinivasan, and Daniel Carter. The FHWA Office of Safety Research and Development Contract Task Order Manager was Roya Amjadi. The Federal Highway Administration (FHWA) organized a pooled fund study of 26 States to evaluate low-cost safety strategies as part of its strategic highway safety effort. One of the strategies chosen to be evaluated for this study was flashing beacons. Three types of flashing beacons–intersection control beacons, beacons mounted on STOP signs, and actuated beacons–were considered collectively at stop-controlled intersections. This strategy is intended to reduce the frequency of crashes related to driver unawareness of stop control at unsignalized intersections. Geometric, traffic, and crash data were obtained at stop-controlled intersections for 64 sites in North Carolina and 42 sites in South Carolina. Empirical Bayes methods were incorporated in a before-after analysis to determine the safety effectiveness of installing flashing beacons, while accounting for potential selection bias and regression-to-the-mean effects. Overall, installation of flashing beacons in North Carolina resulted in statistically significant reductions in total, angle, and injury plus fatal crashes. The intersections in South Carolina experienced very little change following the introduction of flashing beacons. The combined results from both the States supports the conclusion that an angle crash reduction of a 13 percent and an injury and fatal crash reduction of 10 percent can be expected. The economic analysis based on the combined results for angle and nonangle accidents from both States indicates that standard flashing beacons and some of the actuated ones (i.e., the less expensive beacons) are economically justified, but that a benefit cost ratio of 2:1 may not be achievable for the more expensive actuated beacon types. Table 8. Results for 42 South Carolina Strategy Sites–All Beacon Types Combined. The Federal Highway Administration (FHWA) organized a pooled fund study of 26 States to evaluate low-cost safety strategies as part of its strategic highway safety effort. The purpose of the FHWA Low-Cost Safety Improvements Pooled Fund Study is to evaluate the safety effectiveness of several of the low-cost strategies through scientifically rigorous crash-based studies. One of the strategies chosen to be evaluated for this study was flashing beacons at stop-controlled intersections. This strategy is intended to reduce the frequency of crashes related to drivers' lack of awareness of stop control at unsignalized intersections. The safety effectiveness of this strategy had not previously been documented. This study is an attempt to provide an evaluation through scientifically rigorous procedures. Three types of flashing beacons–intersection control beacons, beacons mounted on STOP signs, and actuated beacons–were considered collectively at stop-controlled intersections. Although these could be considered three distinct safety strategies with different expected performance, because of sample size limitations, they were analyzed collectively in this study. Geometric, traffic, and crash data were obtained at stop-controlled intersections for 64 sites in North Carolina and 42 sites in South Carolina. These States were selected for the study because they had information about the location of these treatments and when these treatments were installed. In both States, sites were selected for this treatment because of a large number of angle crashes involving drivers who had difficulty in recognizing the stop control condition. Empirical Bayes methods were incorporated in a before-after analysis to determine the safety effectiveness of installing flashing beacons, while accounting for potential selection bias and the resulting regression-to-the-mean effects. Overall, installation of flashing beacons in North Carolina resulted in a statistically significant reduction in total crashes, angle crashes, and injury and fatal crashes. The intersections in South Carolina experienced very little change following the introduction of flashing beacons. The combined results from both the States indicate a statistically significant reduction in angle crashes and injury and fatal crashes. From a practical standpoint, the aggregate analysis supports the conclusion that an angle crash reduction of 13 percent and an injury and fatal crash reduction of 10 percent can be expected with the installation of flashing beacons, based on the point estimate. The economic analysis based on the combined results for angle and nonangle crashes from both States indicates that standard flashing beacons (those that flash continuously) and some of the actuated ones (i.e., the less expensive beacons) are economically justified, but that a benefit cost ratio of 2:1 may not be achievable for the more expensive actuated beacon types. Intersections account for a small portion of the total highway system, yet in 2005, approximately 2.5 million intersection-related crashes occurred, representing 41 percent of all reported crashes. Intersection-related crashes account for more than 50 percent of total crashes in urban areas and over 30 percent of total crashes in rural areas. Out of a total of 39,189 fatal crashes in 2005, 22 percent, or 8,655, occurred at or within an intersection environment. (1) The high frequency of crashes is not surprising, however, due to the fact that intersections present more points of conflict than nonintersections. Unsignalized intersections often present potential hazards not associated with signalized intersections. A traffic signal provides distinct priority to specific movements; this priority can be less obvious at unsignalized intersections. This is often problematic on two-lane highways because of the priority of movement on the major roadway. The differences between signalized and unsignalized intersections are also associated with differences in crash types. Unsignalized intersections tend to experience more angle and turning collisions; signalized intersections experience more rear-end collisions. Driver compliance with the intersection traffic control is vital to intersection safety. The typical location of unsignalized intersections, however, presents several challenges. Unsignalized intersections are usually located along low- to moderate-volume roads in rural and suburban areas that are generally associated with high-speed travel and relatively lower geometrics than those in more developed suburban and urban areas. (2) Many unsignalized intersections may be unexpected or may not be visible to approaching drivers, particularly those drivers on the major road. Therefore, enhancing the visibility and conspicuity of unsignalized intersections has the potential to reduce the number of crashes associated with drivers' lack of awareness of the intersection. Flashing beacons may be particularly appropriate for unsignalized intersections with patterns of angle collisions related to lack of driver awareness of the intersection. (2) Flashing beacons can be designed in such a way as to flash all the time or flash only when a sensor detects a vehicle approaching the intersection (an actuated beacon). Beacons can be installed either overhead, as shown in figure 1, or mounted directly on a STOP sign, as shown in figure 2. Some of the actuated overhead beacons are supplemented with a sign that indicates "Vehicles Entering When Flashing." The success of this strategy will rely on selecting an appropriate combination of markings for the specific conditions on the approaches to the intersection. Figure 1. Photo. Example of Standard Overhead Flashing Beacon. Figure 2. Photo. Example of a STOP Sign Mounted Flashing Beacon. Intersection control beacons that are mounted over the intersection, referred to as "standard overhead beacons" in this report. 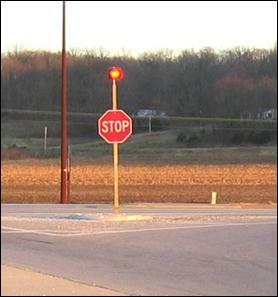 STOP sign mounted flashing beacons, referred to as "standard STOP sign mounted beacons" in this report. Actuated flashing beacons including both those that are mounted over the intersection and mounted on signs, referred to as "actuated beacons" in this report. Collectively, they are referred to in this report as flashing beacons. In 1997, the American Association of State Highway and Transportation Officials (AASHTO) Standing Committee for Highway Traffic Safety, with the assistance of the FHWA, the National Highway Traffic Safety Administration (NHTSA), and the Transportation Research Board (TRB) Committee on Transportation Safety Management, met with safety experts in the field of driver, vehicle, and highway issues from various organizations to develop a strategic plan for highway safety. These participants developed 22 key areas that affect highway safety. One of these areas is unsignalized intersection crashes. The National Cooperative Highway Research Program (NCHRP) published a series of guides to advance the implementation of countermeasures targeted to reduce accidents and injuries. Each guide addresses one of the 22 emphasis areas and includes an introduction to the problem, a list of objectives for improving safety in that emphasis area, and strategies for each objective. Each strategy is designated as "proven," "tried," or "experimental." Many of the strategies discussed in these guides have not been rigorously evaluated; about 80 percent of the strategies are considered "tried" or "experimental." The FHWA organized a pooled fund of 26 States to study low-cost safety strategies as part of the strategic highway safety effort. The purpose of the Pooled Fund Study was to evaluate the safety effectiveness of several low-cost safety strategies, both tried and experimental, through scientifically rigorous crash-based studies. Based on inputs from the Pooled Fund Study Technical Advisory Committee and the availability of data, installing flashing beacons at unsignalized intersections was selected as a strategy that should be evaluated as part of this effort. 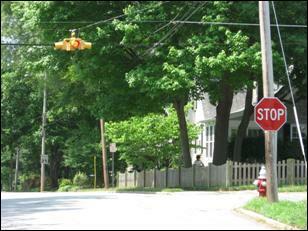 Very few studies have evaluated flashing beacons at stop-controlled intersections. Cribbins and Walton evaluated the safety impacts of flashing beacons at 14 rural intersections in North Carolina that were installed after 1965. (4) They compared at least one year of crash data before the beacons were installed to at least one year of crash data after the installation of the beacons. Based on the severity level of each accident and the total number of vehicles entering the intersections, an equivalent property damage only (EPDO) rate was computed. The EPDO rate before the installation of the beacons was compared with the EPDO rate after the installation. Following the installation of the beacons, the EPDO rate decreased by 48 percent. Based on a paired t-test, the authors concluded that the reduction was statistically significant at the 0.01 level. Pant et al. compared the crash rates at six stop-controlled intersections without a beacon to seven stop-controlled intersections with a beacon. (5) Fatal, injury, property damage only (PDO), and right-angle crashes were included in the analysis. The mean rates for most accident types were higher at beacon-controlled intersections compared to stop-controlled intersections without a beacon. Considering that beacons may be installed at sites with higher than average crash rates, it is not surprising that beacon-controlled sites had a higher crash rate. A before-after analysis was completed for the seven beacon-controlled sites, which did not include any control sites. The frequency of fatal, serious visible injury, and angle accidents decreased following the installation of beacons; however, none of these reductions were statistically significant based on a chi-square test. More recently, Murphy and Hummer evaluated the safety impacts of flashing beacons at 34 locations in North Carolina. (6) All of the locations were four-leg intersections with no turn lanes and two-way stop control. Three different methods were used to conduct the analysis: naïve before and after analysis, before and after analysis using a safety performance function, and the Empirical Bayes (EB) method. The naïve before and after analysis revealed a 10-percent reduction in total crashes, 15-percent reduction in injury crashes, 66-percent reduction in severe injury crashes, 11-percent reduction in frontal impact crashes, and a 50-percent reduction in ran STOP sign crashes. A safety performance function developed by Vogt and Bared(1) for intersections in Minnesota was recalibrated using data from 170 reference intersections in North Carolina. This method showed a 13-percent increase in total crashes following the introduction of flashing beacons. The EB approach was applied to account for potential effects of regression-to-the-mean. The EB approach also made use of data from the reference population, but accounted for the increase in traffic volume using a linear assumption. However, considering that the safety performance function used by the authors showed that the relationship between crash frequency and major and minor average annual daily traffic (AADT) is not linear, assuming a linear change will give an incorrect result. Their EB approach revealed a 12-percent decrease in total crashes, 9-percent decrease in injury crashes, 40-percent decrease in severe-injury crashes, 9-percent decrease in frontal-impact crashes, and 26-percent reduction in failure-to-stop crashes. Based on the referenced studies, it can be concluded that the safety effectiveness of flashing beacons at stop-controlled intersections has not been adequately quantified. Two studies were based on a limited sample and did not apply state-of-the-art methods to account for potential effects of regression-to-the-mean. The third study attempted to use the EB method to account for regression-to-the-mean, but did not properly account for changes in traffic volume. It is clear that a thorough investigation is needed that will properly account for both regression-to-the-mean and changes in traffic volume is needed to evaluate the effectiveness of flashing beacons in reducing crash frequency and severity for different configurations of unsignalized intersections. Total intersection injury and fatal crashes (including K, A, B, and C on KABCO scale). Area type (rural, suburban, or urban). Intersection type (two-way versus four-way stop-controlled). Types of flashing beacon installations (standard overhead, standard STOP sign mounted, and actuated). The need to select a large enough sample size to detect, with statistical significance, what may be small changes in safety for some crash types. The need to carefully select reference sites. The need to properly account for traffic volume changes. The need to pool data from multiple jurisdictions to improve reliability of the results and facilitate broader applicability of the products of the research. The study design involved a sample size analysis and prescription of needed data elements. This was done to assess the sample size required to detect statistically an expected change in safety and also determine what changes in safety can be detected with likely available sample sizes. Assumptions on the expected safety effects and on the crash frequency at potential strategy sites in the before period are basic to estimating sample sizes. Following a literature review, and the application of methodology in Hauer,(9) a minimum sample size was estimated. This sample size analysis undertaken for this study addresses how large a sample is required to statistically detect an expected change in safety. For this analysis, it was assumed at the time the study was designed that a conventional before-after study with reference group design would be used, since available sample size estimation methods are based on this assumption. To facilitate the analysis, it was also assumed that the number of reference sites is equal to the number of strategy sites. The sample size estimates provided would be conservative in that state-of-the-art EB methodology proposed for the evaluations would require fewer sites. Table 1. Before Period Crash Rate Assumptions. Table 2 provides estimates of the required number of before period intersection-years in the sample for both the 90-percent and 95-percent confidence levels. The calculations assume equal number of intersection-years for strategy and comparison sites and equal length of before and after periods. Intersection-years is the number of intersections where the strategy was applied multiplied by the number of years the strategy was in place at each intersection. For example, if a strategy was applied at 9 intersections and has been in place for 3 years at all 9 intersections, this is 27 intersection-years. A minimum sample size of 135 intersection-years and a desirable sample size of 260 intersection-years per period were calculated as shown in bold in table 2. It was expected that these sample sizes could be reduced if the assumption for crashes per intersection-year before strategy implementation turns out to be conservatively low for strategy data, or if more after period years than assumed are available. The desirable sample assumes that the reduction in crashes could be as low as a 10-percent reduction in all crashes and that this is the smallest benefit that one would be interested in detecting with 90-percent confidence. The logic behind this approach is that safety managers may not wish to implement a measure that reduces crashes by less than 10 percent, and the required sample size to detect a reduction smaller than 10 percent would likely be prohibitively large. The minimum sample indicates the level for which a study seems worthwhile (i.e., it is feasible to detect with 90-percent confidence the largest effect that may reasonably be expected based on what is known currently about the strategy). In this case, a 20-percent reduction in right-angle crashes was assumed as this upper limit on safety effectiveness. These sample size calculations were based on specific assumptions regarding the number of crashes per mile and years of available data. Estimates may be predicted with greater confidence or a smaller reduction in crashes will be detectable if it turns out that there are more intersection-years of data available in the after period. The same holds true if there is a higher crash rate than expected in the before period. Table 2. Minimum Required Before Period Site-Years for Treated Sites for Crash Rate Assumptions. Note: Bold denotes the minimum sample size and desirable sample size calculated for intersection-years per period. It provides a foundation for developing guidelines for estimating the likely safety consequences of contemplated strategy. λ is the expected number of crashes that would have occurred in the after period without strategy. π is the number of reported crashes in the after period. In estimating λ, the effects of regression-to-the-mean and changes in traffic volume are explicitly accounted for using safety performance functions (SPFs) relating crashes of different types to traffic flow and other relevant factors for each jurisdiction based on untreated sites. Annual SPF multipliers are calibrated to account for the temporal effects on safety of variation in weather, demography, crash reporting, and so on. A factor is then applied to m to account for the length of the after period and differences in traffic volumes between the before and after periods. This factor is the sum of the annual SPF predictions for the after period divided by P, the sum of these predictions for the before period. The result, after applying this factor, is an estimate of λ. The procedure also gives an estimate of the variance of λ, the expected number of crashes that would have occurred in the after period without strategy. The estimate of λ is then summed over all sites in a strategy group of interest (to obtain λ sum) and compared with the count of crashes during the after period in that group (πsum). The variance of λ is also summed over all sites in the strategy group. The percent change in crashes is calculated as 100(1- θ ); thus a value of θ = 0.7 with a standard deviation of 0.12 indicates a 30-percent reduction in crashes with a standard deviation of 12 percent. This section provides a summary of the data assembled for the analysis. Data were collected in two States, North Carolina and South Carolina. These States were selected because they could provide installation locations and dates for flashing beacons that were installed in the last ten years. In both the States, flashing beacons were installed at locations where the data showed a large number of angle crashes and where drivers had difficulty recognizing the stop control condition. All crashes that occurred within 76.25 m (250 ft) of the intersection were considered intersection-related. The North Carolina Department of Transportation (NCDOT) provided project files from multiple districts with details about the installation of flashing beacons. For many of the sites, these files indicated whether the flashing beacon was installed overhead, on the shoulder, or on a STOP sign. They also indicated whether the flashing beacon was actuated or a standard installation. In North Carolina, many of the evaluated flashing beacons were standard (i.e., flash 24 hours a day); however, there were also several actuated installations (i.e., flash only when a vehicle approaches an intersection). The beacons were installed either overhead or on a STOP sign. There were limited installations of flashing beacons at three-leg, or T intersections, only three during the last 10 years, so T intersections were not included in the analysis. The analysis focused on four-leg intersections with two lanes on the major road. For many of the sites with flashing beacons, NCDOT staff had conducted a before-after safety evaluation using nearby sites for a reference group. The reference sites were provided in some of the project files. A safety evaluation was not conducted for all strategy sites, and therefore, some strategy sites had several reference sites and others had none. In addition, NCDOT also provided the reference sites used by Murphy and Hummer(6) in their evaluation. For this project, all reference sites were pooled together to be used as a reference group for developing SPFs as part of the EB procedure. North Carolina is one of eight States that is part of the Highway Safety Information System (HSIS). For participating States, HSIS can provide roadway characteristics and traffic information given the mileposts of the roads. The features-report module in NCDOT's Traffic Engineering Accident Analysis (TEAAS) database was used to identify the mileposts of the major and minor roads for each intersection and a query was run on the HSIS database to obtain roadway characteristics and traffic volumes. HSIS provided data on land use (i.e., rural or urban), number of lanes, lane and shoulder width, and presence of a median. The HSIS database was not able to provide major and minor road AADT for every intersection for all years. For the missing data, the research team tried to use NCDOT's AADT maps by locating each individual intersection in the map initially through GoogleTM Maps. This turned out to be a very time-consuming process. Even after the AADT map search, data were not available for every intersection for all years, especially for the minor roads. If major or minor road AADT data were missing for certain years (but available for other years) at a particular site, the missing data were filled-in using a procedure developed by Lord. (13) AADT data were obtained or estimated for each reference and strategy intersection from 1990 to 2004. Tables 3 and 4 display the number of strategy and reference sites and the number of sites where minor road AADT was available. Table 3. Four-Legged Intersections in North Carolina with both Major and Minor AADT Available. Table 4. Four-Legged Intersections in North Carolina with only Major AADT Available. Crash data for the reference and strategy intersections were extracted from NCDOT's TEAAS database. Crashes may have been recorded in the crash database using alternate names. NCDOT provided alternate street names for each route, which ensured a more complete coverage of crashes when associating the crash data with each intersection. The South Carolina Department of Transportation (SCDOT) provided installation data for 61 flashing beacons in 5 districts. Of these 61 flashing beacons, 12 were mounted on STOP signs and 49 were mounted over the intersection. The majority of the flashing beacons were installed at four-leg intersections on two-lane roads. All the flashing beacons evaluated in South Carolina are standard (i.e., flash 24 hours a day). SCDOT provided a copy of the roadway and traffic data that were collected for the Highway Performance Monitoring System (HPMS). The HPMS is a national highway information system that includes data on the extent, condition, performance, use, and operating characteristics of the Nation's highways. Using the HPMS, intersections with characteristics similar to the strategy sites were chosen for reference sites. Roadway data were collected using the HPMS database. This database provided data on the land use (i.e., urban or rural), number of lanes, lane width, presence of a shoulder, shoulder width, presence of a median, and median type for each intersection approach. Speed limit was not available for the intersections included in this study. The majority of the traffic volumes used for this study was extracted from the HPMS files. Based on communications with the SCDOT, HPMS was the best available source of traffic data for the State. These values come from a segment of roadway ranging from 0.161 to 8.05 km (0.1 to 5.0 mi) or more in length. The range is less in urban areas and greater in rural areas. Therefore, in rural areas, the volume count used to describe the volume entering the intersection may be collected from a point up to 8.05 km (5 mi) from the intersection. There are no records of where in the segment the count was actually collected. SCDOT supplied crash data in two databases. One database contained crashes occurring from 1994 to 2000. The second database contained crashes occurring from 2001 to 2005. The two database system was necessary because the crash data report and some associated variables were modified in 2001. In addition, there was no threshold on reporting property-damage-only crashes prior to 1997. Starting that year, only crashes involving an injury or property damage greater than $1,000 were reported in the system. Based on guidance from the SCDOT, the crash milepost was not used to locate crashes. Instead, the variable "base offset distance" was used to identify crashes occurring at intersections. Table 5 shows the number of strategy and reference sites in South Carolina. Most of the installations were at four-leg intersections along two-lane roads, which was the focus of the analysis. Table 5. Four-Leg Intersections in South Carolina. Table 6 shows the summary of the data from the strategy sites in North Carolina and South Carolina. This table indicates a total sample of 917 intersection-years in the before period (583 in North Carolina and 334 in South Carolina ) and 433 intersection-years in the after period (305 in North Carolina and 128 in South Carolina ). The desired sample size was 260 intersection years to detect a 10-percent reduction in all crashes. More sites were required than originally estimated because the before-period crash rate for North Carolina and South Carolina (2.85 and 2.73, respectively) were lower than the 3.45 crashes per site-year assumed in the study design. However, since the before-period crash rates were only slightly lower and the available sample of intersection years was substantially higher than the desired sample of 260, the sample was deemed adequate to proceed with the analysis. Table 6 also shows that the total crashes per intersection-year in the before period was lower in South Carolina, despite the higher average major and minor AADTs before the installation of flashing beacons. North Carolina experienced substantially more angle and injury/fatal crashes per intersection-year compared to South Carolina. South Carolina experienced more rear-end crashes year. The North Carolina sites experienced a much larger increase in traffic volumes between before and after periods compared to the South Carolina sites. Information from the summary tables should not be used to make simple before-after comparisons of crashes per-site year since such an analysis would not account for factors other than the strategy that may cause safety to change between the two periods. Such comparisons are properly done with the EB analysis discussed in the following sections. Table 6. Summary Data from North Carolina and South Carolina. This section presents the SPFs, which were developed for the EB analysis. Generalized linear modeling was used to estimate model coefficients using PROC GLIMMIX in SAS®(14) and assuming a negative binomial error distribution, which is consistent with the state of the research in developing these models. The over-dispersion parameter (k) is estimated by an iterative process assuming a negative binomial error structure. The over-dispersion parameter relates the mean and variance of the SPF estimate. The value of k is such that the smaller its value, the better a model is for a given set of data. Total intersection injury and fatal crashes (including K, A, B, and C). The SPFs followed one of three forms (see equations 7 through 9). If the SPF was used for the EB analysis of treatment sites where both major and minor road AADT were available, one of the forms from equations 7 or 8 was used. If the SPF was used for the EB analysis of treatment sites where the minor road AADT was not available, the form in equation 9 was used. where Y is the expected number of crashes per year of a particular type, is a dummy variable indicating whether minor road AADT is available or not, X1 is a dummy variable indicating area type (rural/urban/suburban), and X2 is a dummy variable indicating the type of traffic control (two-way versus four-way stop-control); a, b, c, d, and e are parameters to be estimated. EB analysis of rural four-leg strategy intersections where both major and minor AADT were available. Reference group for this EB analysis included rural four-leg reference intersections where both major and minor road AADT were available. EB analysis of rural four-leg strategy intersections where minor road AADT was not available. Ideally, for this group, an SPF should be developed with only reference sites for which minor AADT were unavailable. However, there were only 19 such reference sites–not sufficient for developing an SPF–so a reference group including all rural four-leg intersections with and without minor AADT was identified. In estimating the SPF, a dummy variable was introduced to indicate whether or not minor road AADT was available. EB analysis of suburban and urban four-leg strategy intersections where both major and minor road AADT were available. Again, under ideal conditions, SPFs would be developed separately for suburban and urban four-leg reference intersections. However, there was not a sufficient sample of either suburban or urban reference sites to develop separate SPFs. Neither were there sufficient sites to develop SPFs for urban and suburban intersections as a group. Therefore, a reference group that included four-leg rural, suburban, and urban intersections was used to develop an SPF with dummy variables that represented area type (i.e., suburban, urban, and rural categories). This SPF was used for urban and suburban strategy sites; for rural sites the SPF used was identified under the first bullet above. EB analysis of suburban and urban four-leg reference intersections where minor road AADT was not available. In accordance with the discussion above, a reference group that included four-leg rural, suburban, and urban intersections with and without minor AADT was used to develop an SPF with dummy variables that represented area type (i.e., suburban, urban, and rural categories), and a dummy variable to indicate whether or not minor road AADT was available. This SPF was used for urban and suburban strategy sites where minor road AADT was not available; for rural sites where minor road AADT was not available, the SPF used was identified under the second bullet above. Freeman Tukey R-square (R-square (FT)) based on the approach outlined in Fridstrom et al. (15) This R-square usually tends to be higher for datasets with a large number of crashes per site. Since the number of crashes at stop-controlled intersections is relatively low, this R-square is quite low for most of the models estimated in this study. Pseudo R-square based on the method discussed in Miaou. (16) The Pseudo R-square is estimated based on k for the model under consideration compared with k estimated for a model with just a constant term without any independent variables. The Pseudo R-square is preferred by some researchers for datasets with low number of crashes. In general, the Pseudo R-square was higher (exceeded 0.5) for the model forms that included both Major and Minor Road AADT in North Carolina. Tables 11 and 12 also show the annual (calibration) factors that were estimated from each of these models. The annual factor for a particular year is defined as the ratio of observed to predicted crashes for that year. Annual factors are used to account for the effect of changes in other factors over time (e.g., weather, crash reporting practices, and demography). Annual factors for all four models were estimated based on the SPFs developed for total crashes. Only one set of SPFs was developed in South Carolina, because of the limited sample of reference intersections. Dummy variables were introduced for area type and type of traffic control (four-way versus two-way stop-control). Table 13 in appendix B shows the details of the SPFs developed with data from reference sites in South Carolina. Based on the data, results for North Carolina and South Carolina are presented in the following sections in two parts: the first part contains aggregate results for each State and for the two States combined; the second part discusses a disaggregate analysis of the factors that may be most favorable to the installation of flashing beacons. The aggregate results are shown in tables 7 through 9. All three types of flashing beacons are combined together in these results. Results that are statistically significant at the 95-percent confidence level are shown in bold. The tables show the EB estimate of the crashes expected in the after period if the beacon had not been installed, the actual number of crashes in the after period, and two measures of change. The first measure of safety effect is the estimated percent change due to the particular safety improvement strategy along with the standard error (S.E.) of this estimate; a negative value indicates an increase in crashes. A percent change that is at least 1.96 times higher than the standard error is statistically significant at the 5-percent level (equivalent to a confidence level of 95 percent); similarly, a change that is at least 1.64 times higher than the standard error is statistically significant at the 10-percent level (a confidence level of 90 percent). The second measure of safety effect is the change in the number of crashes per site year; this is the difference between the EB estimate of crashes expected in the after period and the count of observed crashes in the after period, divided by the number of site-years during the after period. Table 7. Results for 64 North Carolina Strategy Sites–All Beacon Types Combined. Note: Bold denotes results that are statistically significant at the 95% confidence level. Intersections in North Carolina experienced a statistically significant reduction (at the 95-percent confidence level) in total crashes, angle crashes, and injury and fatal crashes. The reduction in rear-end crashes was not statistically significant. The sites in South Carolina experienced very little change and all changes were highly insignificant. Nevertheless, the combined results in table 9 for the two States still indicate highly significant reductions in angle and injury and fatal crashes. Since North Carolina has more site-years compared to South Carolina (305 versus 128), it should not be surprising that the combined results shown in table 9 are dominated by the results from North Carolina . The next section provides the results of a disaggregate analysis to see if these effects are more or less prominent under specific conditions. In reviewing the results of the disaggregate analysis, readers should note that disaggregate analyses are, by nature, based on smaller sample sizes than aggregate analyses, and smaller samples lead to larger standard errors and less precise results. Note: A negative sign indicates an increase in crashes. Table 9. Combined Results for 106 North Carolina and South Carolina Strategy Sites–All Beacon Types Combined. Area type: Flashing beacons seem to be more effective at rural and suburban locations. The sample size for suburban and urban intersections is quite low, resulting in effects that are highly insignificant; consequently, this result needs to be applied with caution. Traffic control (two-way and four-way stop-controls): There is an indication that flashing beacons may be more effective at reducing angle crashes at four-way stop-controlled intersections compared to two-way stop-controlled intersections; however, the reduction in angle crashes at four-way stop-controlled intersections is not significant. Beacon type and location: This includes standard beacons where the beacon flashes all the time and actuated beacons. Some of the actuated flashers are supplemented with a sign that reads "vehicles entering when flashing." Standard beacons can be located overhead or on a STOP sign. There seems to be a dramatic reduction in crashes at sites with standard beacons mounted on a STOP sign. However, only five sites belong to this category, and therefore, it is not possible to make definitive conclusions regarding beacon location. The three types of beacons analyzed could be considered three distinct countermeasures with differing levels of safety effectiveness. There is anecdotal evidence that suggests that the overhead beacons have been interpreted as indicating a four-way stop at locations that were in fact only a two-way stop. This has caused motorists to pull out in front of the approaching vehicles because they assumed the approaching vehicle would be stopping. This has not been reported as being an issue at locations with STOP sign mounted beacons. The project team attempted to discern the different safety effects of the three types of beacons as shown in table 10. However, there was not a large enough sample size of each of the three countermeasures to produce significant results for each of the individual analysis. Because of the limited number of sites in both States, it was also not possible to look at the safety effect of combinations of factors (e.g., beacon type and area type). The effect of AADT was explored in the disaggregate analysis, but this variable does not appear to have an impact on the strategy effectiveness. Table 10. Results of the Disaggregate Analysis for Angle Crashes. Notes: Bold denotes results that are statistically significant at the 95% confidence level. A negative sign indicates an increase in crashes. An analysis was conducted to study the economic feasibility of this strategy. This economic analysis was accomplished by estimating the life cycle annual cost of the strategy and comparing this to the expected annual crash cost savings per intersection. In estimating the life cycle annual costs, a discount rate of 7 percent (suggested by Office of Budget and Management) was used. Crash costs were estimated from the most recent FHWA unit crash cost data for unsignalized intersections. (8) Separate calculations were done for standard and actuated beacons because of the significant difference in the installation costs for these two types of beacons. The maintenance and utility costs for both beacon types range from $400 to $720 per year (an average of $560). The life of a flashing beacon is at least 10 years. The crash-saving benefit was estimated by considering the effects on angle and nonangle crashes. Based on the results in table 10, it is assumed that these effects are similar enough for the two beacon types for the combined results in table 9 to be used. Those results show a reduction of 0.21 angle crashes per site year. The effect on nonangle crashes was deduced from the numbers for total and angle crashes. From these, an increase of 0.06 crashes per site year was obtained for nonangle crashes. The most recent FHWA mean comprehensive costs per crash per year for unsignalized intersections are $13,238 for rear-end and $61,114 for angle crashes. (8) The comprehensive crash costs represent the present value, computed at a discount rate, of all costs over the victim's expected life span that result from a crash. The major categories of costs used in the calculation of comprehensive crash costs included medically-related costs, emergency services, property damage, lost productivity, and monetized quality-adjusted life years. (8) Angle and rear-end crashes are the two most common types of crashes at stop-controlled intersections and the overall severity of nonangle crashes is quite similar to rear-end crashes. Therefore, the cost for nonangle crashes was assumed to be equal to the cost of rear-end crashes. Using these comprehensive crash costs, the savings because of the reduced crashes was $12,040 per site-year (0.21 of $61,114 minus 0.06 of $13,238). Using the life-cycle cost estimated for standard beacons based on the higher installation and maintenance costs, this savings translates to a 2.6:1 benefit cost ratio (12,040/4,636). If a life-cycle cost of $1,841 is used (based on average installation and maintenance costs), a 6.5:1 benefit cost ratio is achieved. For the actuated beacons, a benefit cost ratio of 3.1:1 is achieved if average installation and maintenance costs are used. If the higher installation and maintenance costs are used, the costs exceed the benefit. Further calculations revealed that for actuated beacons that cost less than $79,000, the benefit exceeds the costs; for installations less than approximately $37,000, a 2:1 benefit is achieved. The objective of this study was to evaluate the safety effectiveness, as measured by crash frequency, of flashing beacons at unsignalized intersections. The study was designed to detect a 10-percent reduction in all crashes with 90-percent confidence. The study also examined the effects of flashing beacons on specific crash types including angle, rear-end, and injury and fatal crashes. Intersections in North Carolina experienced a statistically significant reduction (at the 95-percent confidence level) in total crashes, angle crashes, and injury and fatal crashes following the installation of flashing beacons. The intersections in South Carolina experienced very little change following the introduction of flashing beacons, and those changes were highly insignificant. In general, the flashing beacons at unsignalized intersections can be a cost-effective safety improvement, particularly for lower cost, nonactuated installations. The combined results indicate a significant reduction in angle crashes as well as injury and fatal crashes. Based on the conservative lower 95-percent confidence interval of the safety effect estimates, reductions of at least 4 percent for angle crashes and 1 percent for fatal and injury crashes can be expected with the installation of flashing beacons as presented in table 11. The lower 95-percent confidence limit provides a conservative estimate and the disaggregate analysis indicates situations where greater reductions may be expected. The safety effect may be larger for STOP sign mounted beacons; however, there was not a large enough sample size to make this determination. It is likely that flashing beacons will be most effective at rural intersections and locations with a high frequency of target collisions (i.e., right-angle, injury, and rear-end), particularly where driver awareness may be an issue. However, it may be necessary to use the point estimate (13-percent reduction for angle crashes and 10-percent reduction for injury and fatal crashes) when comparing various potential countermeasures, particularly when confident limits are not available for potential strategies. This way, all countermeasures are treated equally when making a cost-benefit comparison. Table 11. Expected Crash Reductions for Flashing Beacons. Note: The conservative estimates are based on the lower 95% confidence interval and are calculated as the point estimate minus 1.96 times the standard error. The economic analysis based on the combined results for angle and nonangle accidents from both States indicates that standard flashing beacons and the less-expensive actuated beacons are economically justified, but that a benefit cost ratio of 2:1 may not be achievable for the more expensive actuated beacons. Future research on the impacts of the location of the beacon, overhead or mounted on a STOP sign, could provide additional insights. Table 12. SPFs for Rural Intersections in North Carolina. Table 13. SPFs for Suburban and Urban Intersections in North Carolina. Note: This SPF was developed using rural, suburban, and urban intersections but the intercepts for suburban and urban are only shown, because this SPF was not used for rural intersections. Table 14. SPFs for Intersections in South Carolina. This report was prepared by Vanasse Hangen Brustlin, Inc (VHB) for the Federal Highway Administration, Office Safety under Contract DTFH61-05-D-00024. The current FHWA COTM for this project was Roya Amjadi. Kerry Perrillo Childress served as FHWA COTM from September 2005 until December 2006. Kimberly Eccles, P.E, of VHB was the study principal investigator. Dr. Raghavan Srinivasan, of the UNC Highway Safety Research Center (HSRC), conducted the analysis of the strategy and is the primary author of the report. He was supported by Daniel Carter also of the HSRC. Dr. Bhagwant Persaud and Craig Lyon, subcontractors to VHB, developed the study design and provided general oversight of the analysis. Other significant contributions to the study were made by Eric Rodgman and Charles Hamlett of HSRC and Dr. Hugh McGee, Dr. Forrest Council, Nancy X. Lefler, Michelle Scism, and Frank Gross of VHB. Shawn Troy, Brian Murphy, and Brian Mayhew from the North Carolina Department of Transportation. Ms. Amelia Glisson and Charles Jones from the South Carolina Department of Transportation. National Highway Traffic Safety Administration, National Center for Statistics and Analysis. Traffic Safety Facts 2005. National Center for Statistics and Analysis, Washington, DC, 2005. NCHRP Report 500 Volume 5: A Guide for Addressing Unsignalized Intersection Collisions. Transportation Research Board, Washington DC, 2003. Manual of Uniform Traffic Control Devices for Streets and Highways (MUTCD), Federal Highway Administration, McLean, VA 2003. Cribbins, P.D. and Walton, C. M., Traffic signals and overhead flashers at rural intersections: their effectiveness in reducing accidents, Highway Research Record 325, 1970, pp. 1–14. Pant, P.D., Park, Y., Neti, S.V., and Hossain, A.B., Comparative study of rural stop-controlled and beacon-controlled intersections, Transportation Research Record 1692, 1999. Murphy, B.G. and Hummer, J.E., Development of crash reduction factors for overhead flashing beacons at rural intersections in North Carolina, Presented at the 2007 Annual Meeting of the Transportation Research Board, Washington, DC, January 2007. Vogt, A. and Bared, J.G., Accident models for two-lane rural roads: segments and intersections. Report No. FHWA-RD-98-133, FHWA, October 1998. Council, F., E. Zaloshnja, T. Miller, and B. Persaud, Crash Cost Estimates by Maximum Police-Reported Injury Severity within Selected Crash Geometries. Federal Highway Administration, McLean, VA, October 2005. Hauer, E., Observational Before-After Studies in Road Safety: Estimating the Effect of Highway and Traffic Engineering Measures on Road Safety. Pergamon Press, Elseviser Science Ltd., Oxford, U.K., 1997. Stackhouse, S. and Cassidy, P. Warning Flashers at Rural Intersections. Report MN/RC-1998/01; Final Report, Minnesota DOT, 1996. Washington, S., B. Persaud, C. Lyon, and J. Oh. Validation of Crash Models for Intersections. Federal Highway Administration, Washington, DC, 2005. FHWA SafetyAnalyst, http://www.safetyanalyst.org/. Extracted November 2006. Lord, D., Procedure to estimate missing year-to-year traffic counts at intersections. Presented at 3rd Transportation Specialty Conference of the Canadian Society for Civil Engineering, London Ontario, June 2000. Statistical Analysis Software® (SAS®), SAS Institute Inc., Cary, North Carolina . Fridstrom, L., Ifver, J., Ingebrigtsen, S., Kulmala, R., and Thomsen, L. K., Measuring the contribution of randomness, exposure, weather, and daylight to the variation in road accident counts. Accident Analysis and Prevention, Vol. 27 (1), 1995, pp. 1–20. Miaou, S.P., Measuring the Goodness-of-fit of Accident Prediction Models. Federal Highway Administration, FHWA-RD-96-040, Oak Ridge, TN: Oak Ridge National Laboratory, 1996.